In absolute terms, banks have progressed farther than companies in many other industries in automating financial processes, and yet their gains may be proportionately smaller in terms of the needs of a fi nancial services industry sector. 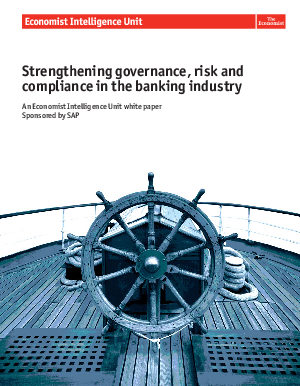 Banks have more to lose from inefficient financial processes and they have faced intensified regulatory compliance demands, both in the case of general regulation such as the Sarbanes-Oxley Act in the United States, the globally mandated industry-specific demands of Basel II, and region- or country-specific directives such as the United Kingdom’s Financial Services and Markets Act or the anti-money laundering provisions of the USA PATRIOT Act. Banks have increased their process automation efforts in response to those pressures, but in dong so they have failed to distinguish themselves from the general trend to focus on the negative aims of cost control and avoidance of regulatory sanctions. This conservative approach has ironically increased banks’exposure to risk at the enterprise level even as it contributes to stronger risk management practices within functions and business lines.